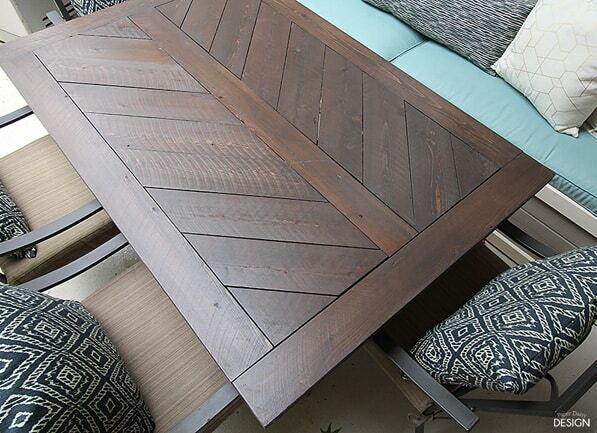 I’m so excited to finally share the details on the Split Herringbone Patio Tabletop today. 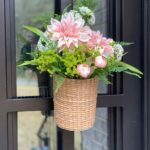 Be sure to follow me on Pinterest and Instagram to get the scoop on my latest DIY’s. 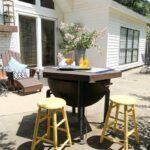 After our outdoor banquette was built and paired with our existing round metal table, we instantly realized we didn’t gain any additional dinning space. Only one person would be able to dine comfortably on the bench side of the round table and of course that was pointless. 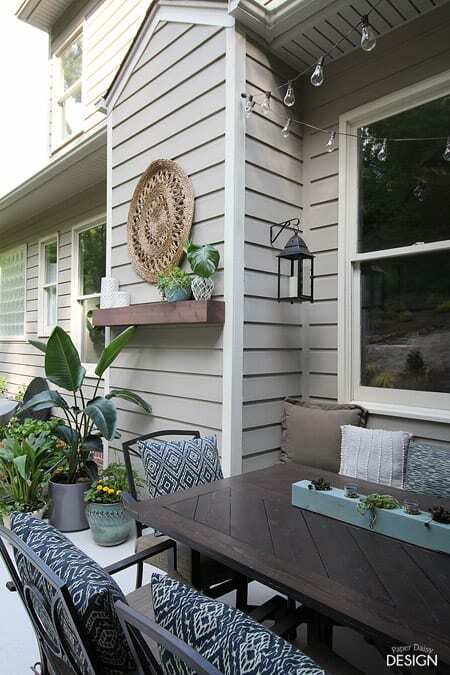 Sure, we could accommodate several people for just lounging, but our goal was to gain additonal dinning space without taking up valuable patio square footage. 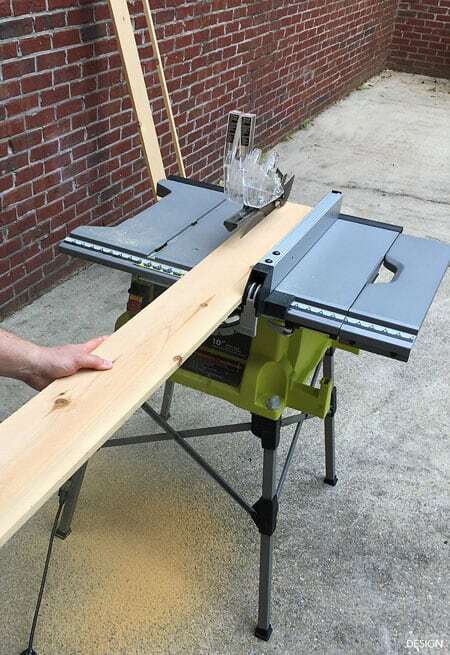 The solution was to build a rectangular tabletop. 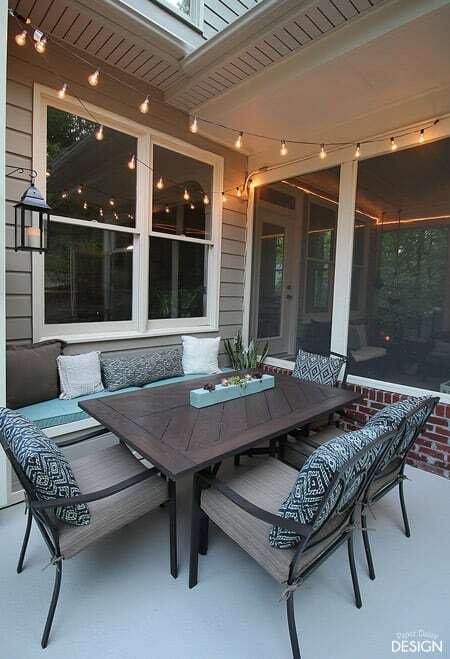 We didn’t see the need to build a new base as the metal table base was just purchased last year and was sturdy. 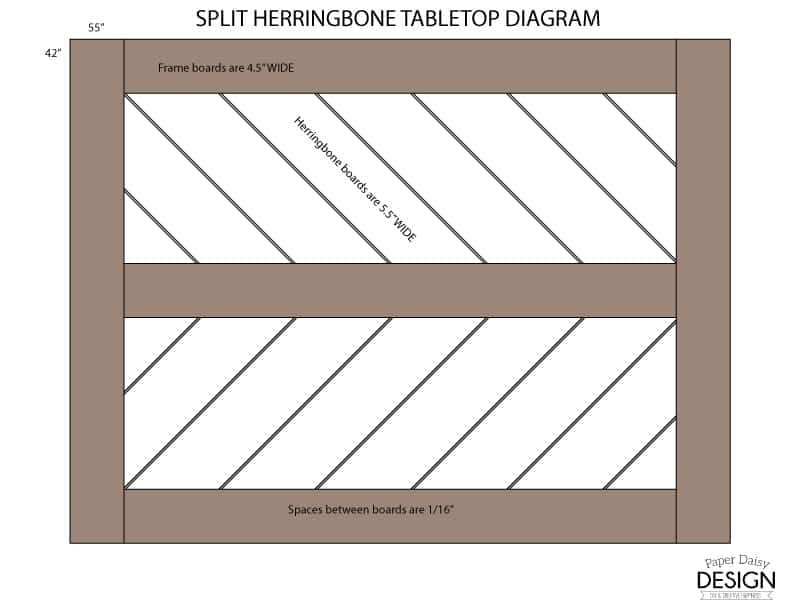 After sketching out several designs, I settled on what I am calling a split herringbone pattern. 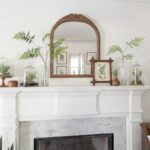 It’s a simplified version of a herringbone. Most importantly though, this design allowed for water to flow through small slits in the top. 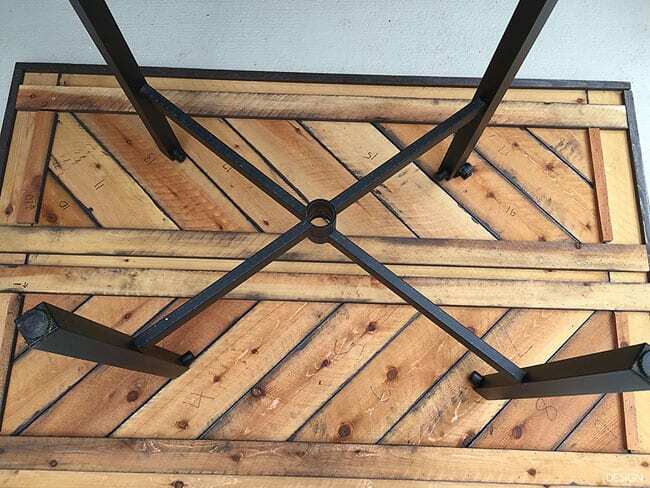 Our table is completely exposed to the elements, so to increase the longevity of the tabletop the slits reduce the amount of standing water. Below are the building diagrams. Want to know the best part? 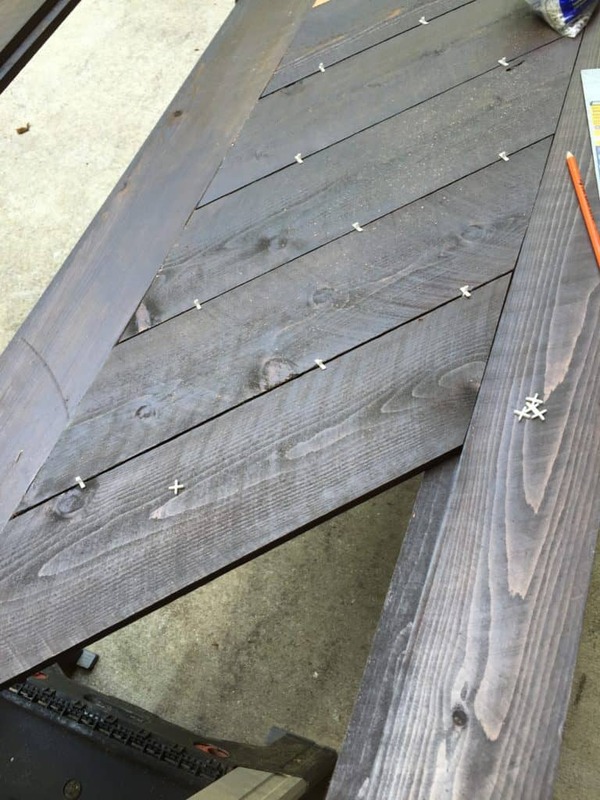 This tabletop can be built for under $30! How is that possible? 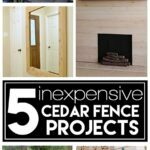 Cedar fencing that costs less than $2.50 at your local Home Depot. And as a finished product, I think cedar looks even better than standard pine. Now I know you want to see exactly how this comes together. Here are the steps. 1. 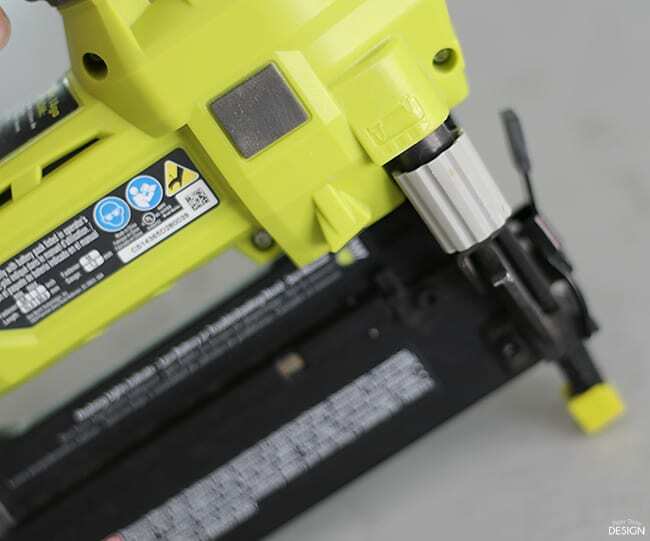 Start with your tabletop frame. 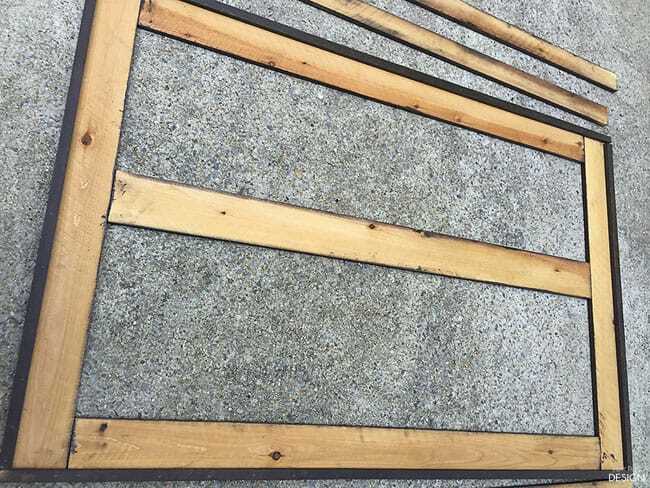 The outside frame boards were ripped down to 4.5″ wide . The best reason I can give for this is it just looked better in the design. 2. 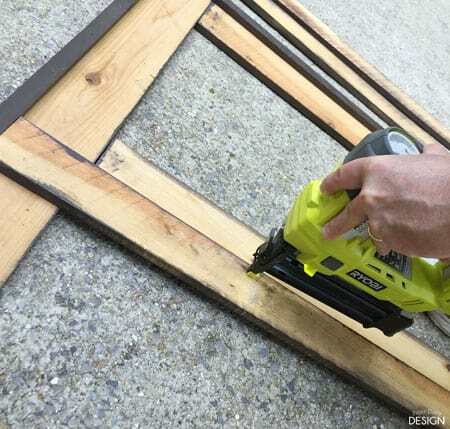 Lay out your frame boards. 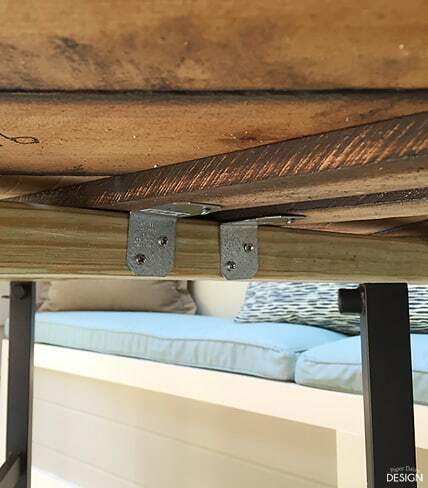 Our table was 42″ deep and 55″ wide, but yours can be anything up to almost 8ft. Although, you would probably want to allow for additional supports if you go that long. 3. 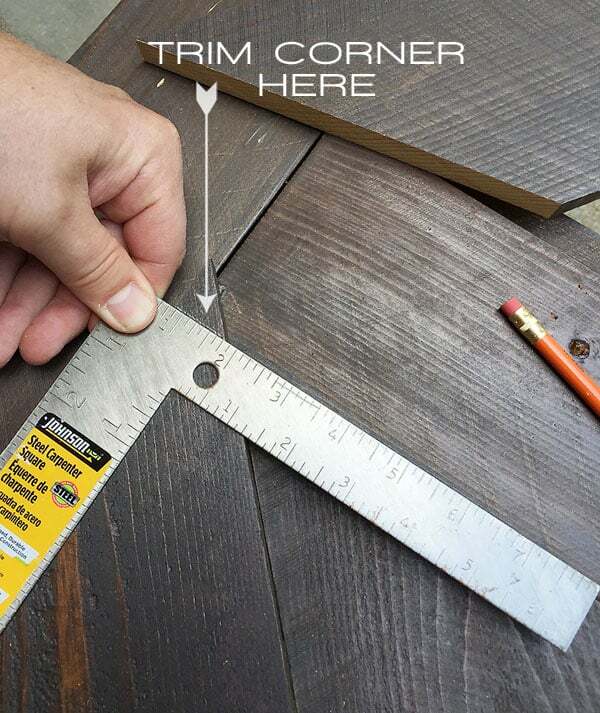 Use the 1″ ripped from the frame boards as trim along the outside edges of the table. 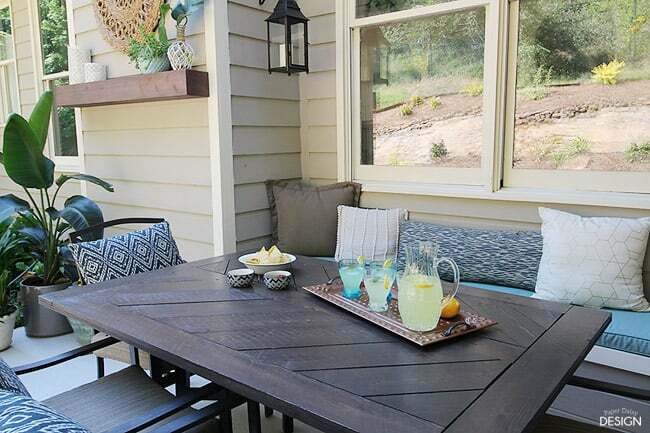 This gives the tabletop some added dimension from a side profile. You’ll note that my boards have a stain finish here. I’ll get to the finishing process later, but I chose to finish all sides before I assembled the tabletop support structure. I wanted every side of the boards to have at least one coat of an outdoor grade spar urethane. So even the boards that look unstained here have a coat of urethane. I couldn’t figure out any other way to size all the herringbone pieces without the structure built and therefore decided to pretreat them before assembly. 3. 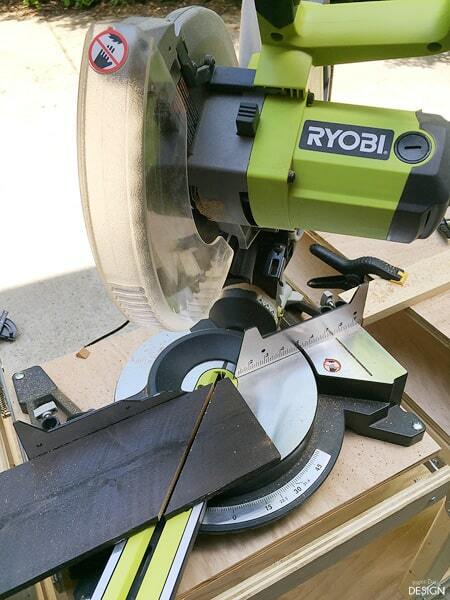 Rip six support boards to 2.75, by cutting a fence board in half, with a table saw or at your home improvement center. 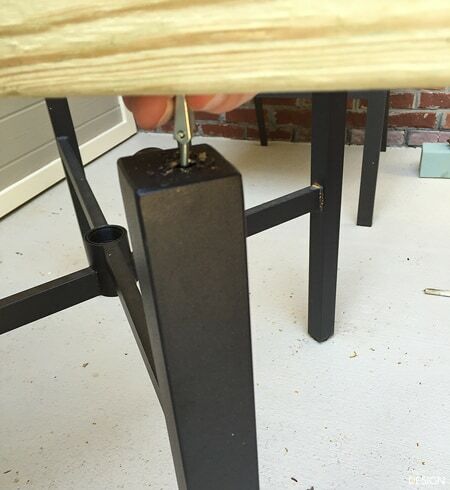 Nail them to the underside of the tabletop. 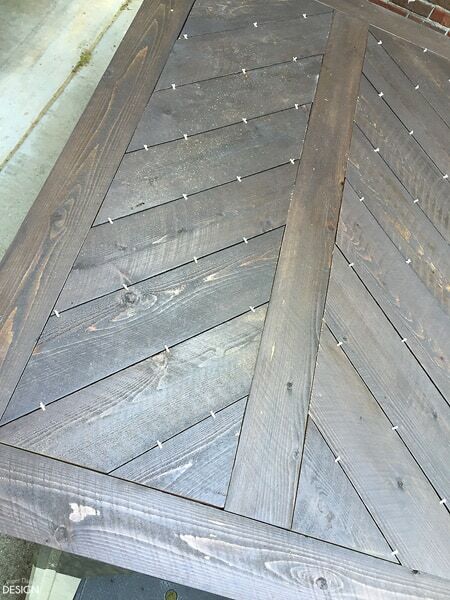 These boards will provide support for the boards that make up the herringbone pattern. 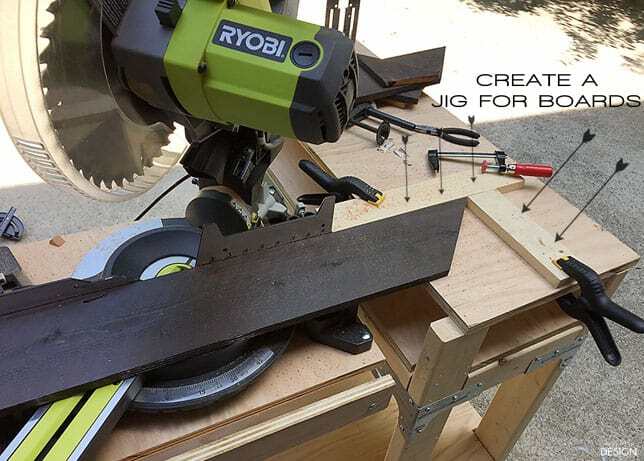 The Ryobi Airstrike Nailgun makes easy work of this. 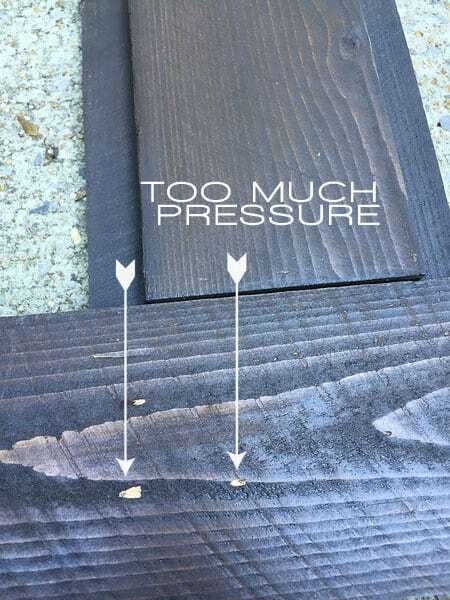 Tip: Before you begin nailing any of your boards you will want to test the depth of your 1 1/4 nails as they come out of the nail gun. Our pressure was technically fine, but somewhere along the way we applied too much pressure to the top of the nail gun and we got this. It was surprisingly easy to fix with just a touch of stain, followed by an additional top coat, which I was going to add either way. 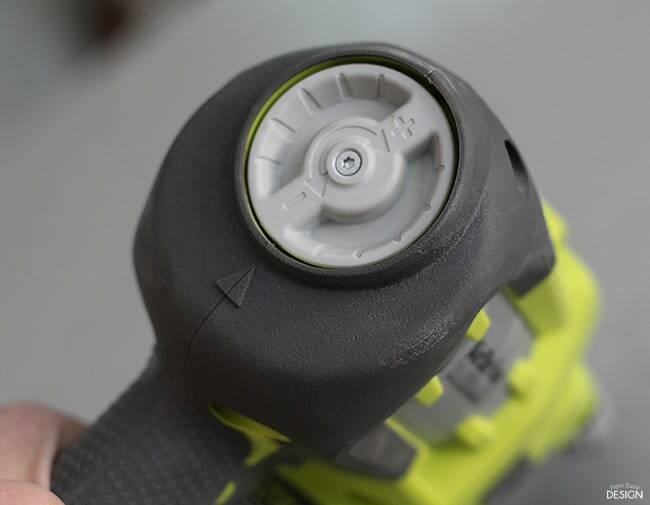 You can also easily make adjustments to the Ryobi Air Strike by adjusting the air pressure with this dial. Or increase or decrease the nail depth, by adjusting this grey dial on the side. 4. 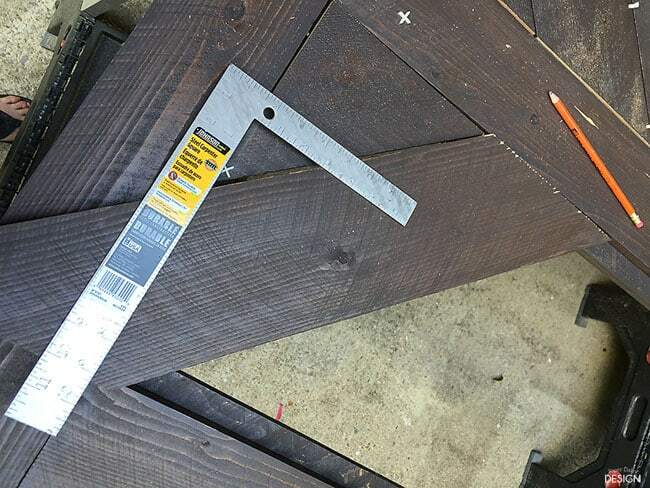 Flip your table right side up and begin cutting the first herringbone board at a 45 degree angle using a miter saw. Cedar is pretty soft, so this can be done with a traditional miter box. 5. Because of slight variation in the assembly of the top and the very small margin of error for creating a herringbone pattern, I’m hesitant to give you an exact measurement here. We began by laying the first board on the table and measuring out the correct distance. Then, we created a jig to keep each board the same length. We noticed there was a slight, less than a 1/4″, difference from the right side to the left side. 6. To finish off the ends of each section, the last full length board needed the corner nicked just a bit. 7. 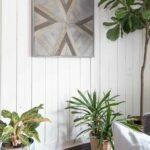 To create the triangular piece in the corner, we used a scrap from one of the herringbone board ends and cut it in the opposite direction. Each of these corner pieces were custom made to fit like a puzzle. That might sound a little complicated or intimidating, but once your working with the pieces it’s quite simple. 8. As we added boards, we also added in our 1/16″ tile spacers. 9. We dry fit all the pieces before attaching anything. 10. 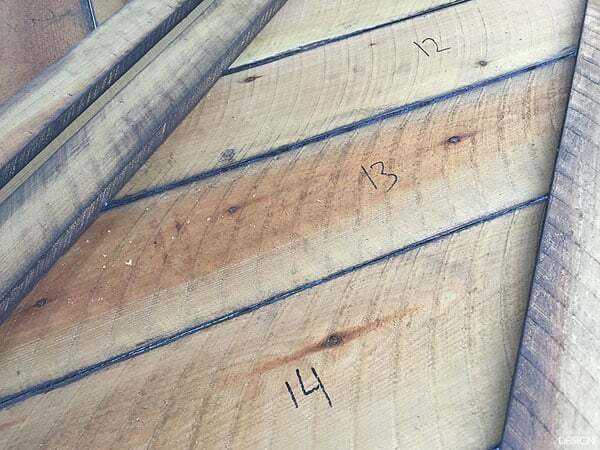 Before you move on, from the underside, be sure to number your herringbone boards for future reference. We were using a pair of saw horses under the table and just crawled underneath to mark them up. 11. 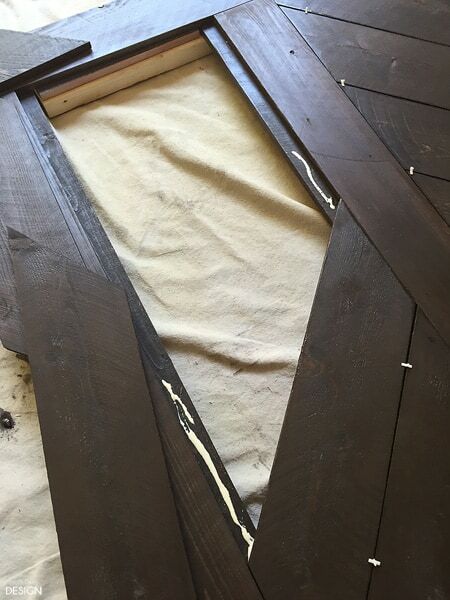 Once all the boards were cut, each of the cut edges of the boards got a coat of stain. They also received another coat of urethane finish. 12. After the stain and urethane were dry, using the numbering as a reference, I glued all the pieces in place and allowed it to dry overnight. The next day, I flipped the tabletop over and nailed all the pieces in place. And there you have it, a finished split herringbone top! 13. Now you are ready to attach your tabletop to your base. 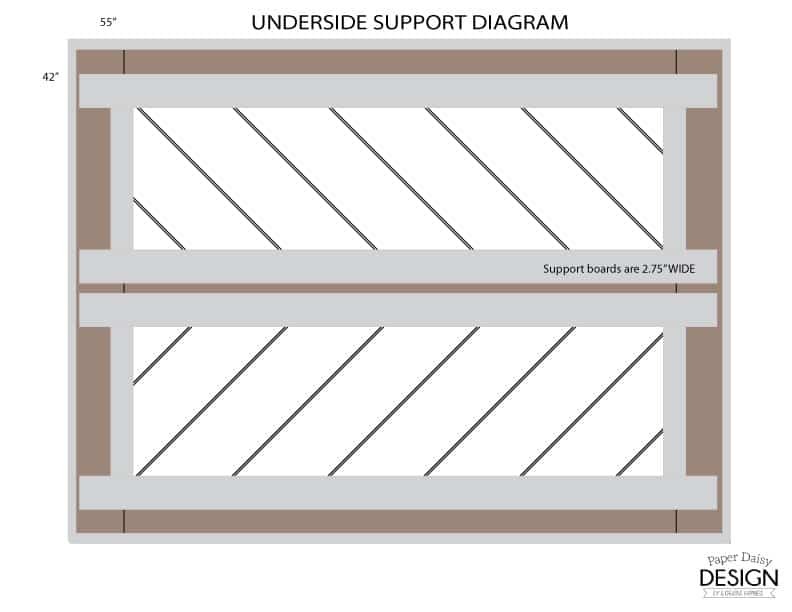 We used treated 2×4’s running perpendicular the existing support structures. 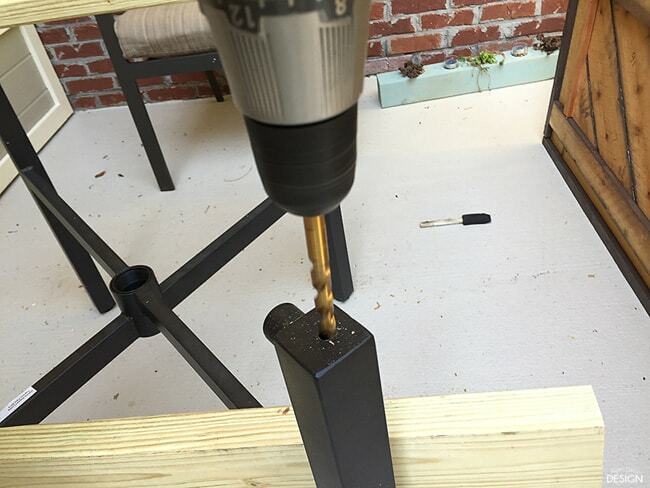 For our metal legs, we used a metal bit to drill holes into the top of the legs. Then, we predrilled holes into the 2×4’s for toggle bolts to go through. Tip: To mark exactly where the holes should go we used a marker to trace the edges of the hole on the legs and then firmly pushed the wood into the leg. This left an impression and marked exact location of the holes. As you tighten the screw at the top, adding a washer for stability, the wings of the toggle bolt will open and secure the 2×4 to the leg. Now, let’s back up and talk about the custom finish. Before I even began applying a stain, I gave all the top sides of the boards a good sanding and a topcoat of Pre-Stain Wood Conditioner. This is a important finishing measure most people skip. 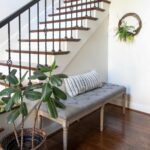 While it is an added expense and creates an additional step, it starts to close the grain of soft woods like cedar or pine, allowing them to accept stains more evenly. 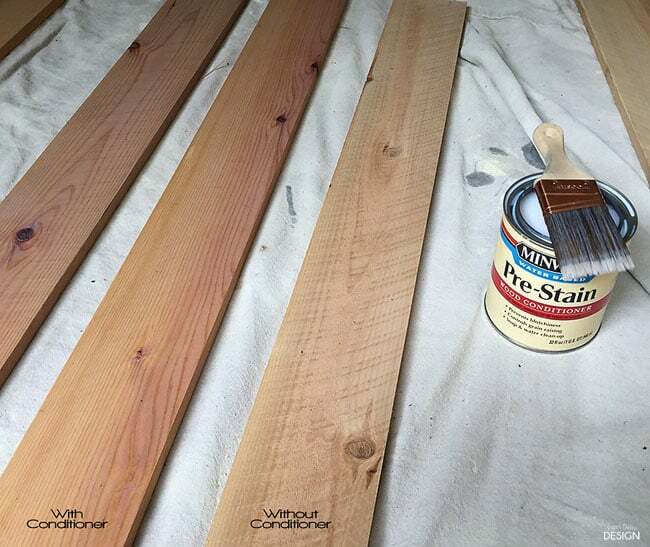 You can see that the conditioner slightly changes the color of the wood while it’s wet, but less so when it’s dry. For the actual finish, even after the conditioner, the stain was more opaque than I wanted. So after mixing the two Varathane stains, in the colors Kona and Weathered Grey, I added some mineral spirits to dilute. 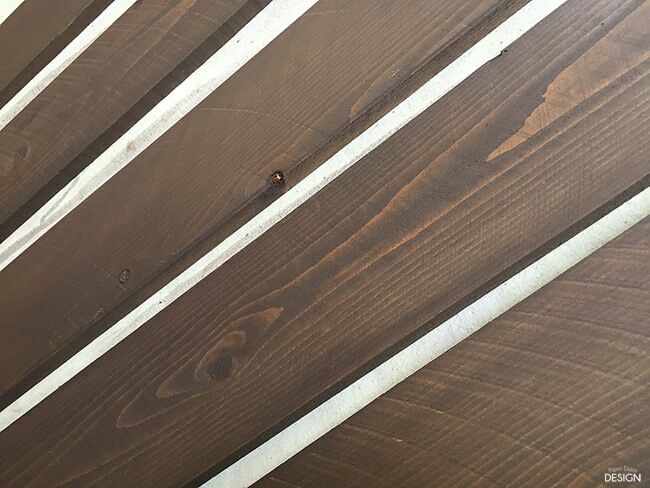 I really wanted to see the grain of the wood, but the Grey finish is not very transluscent. 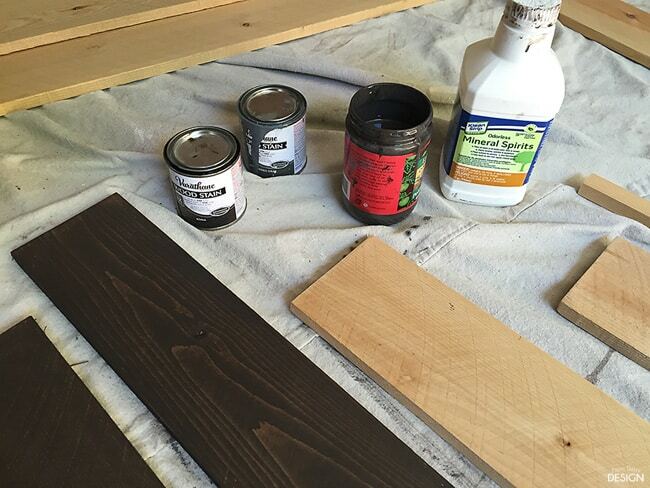 I applied the stain with a high quality brush and then immediately wiped the board down with an clean, old T-shirt. 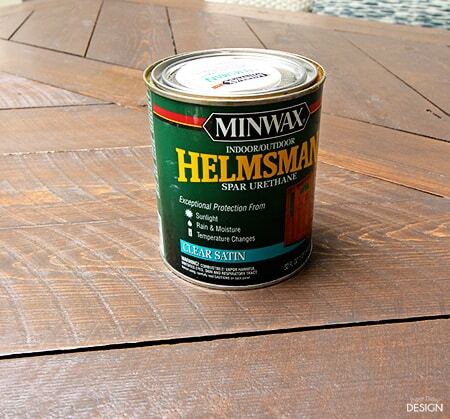 In the end, each of the stained surfaces received three coats of Minwax Helmsman Spar Urethane in Clear Satin. The unfinished sides received just one coat. There has been quite a bit of rain since the table was completed and the finish looks fantastic. 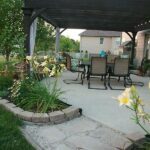 If you’d like to see more of this patio and porch makeover and take a tour, click on the image below. 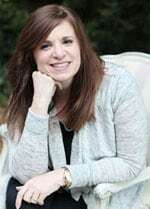 This post contains affiliate links, which at no cost to you, provide support for this blog. Beautiful table!! Thank you for joining Home Sweet Home! what size boards did you start with for this? Any idea how many you needed for the project? Thanks!! The boards are standard cedar fencing. 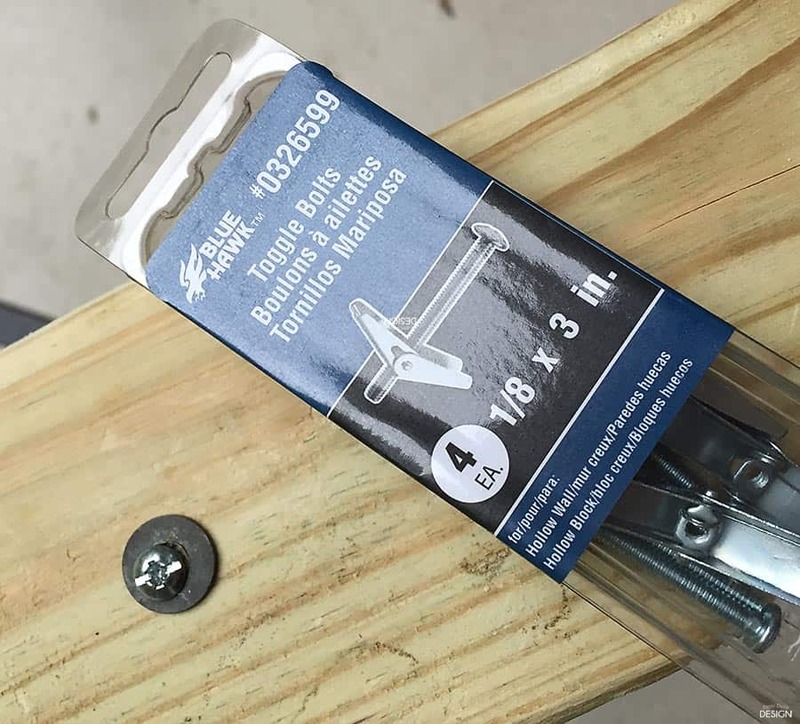 There is a link to the product at The Home Depot in the post. But here it is as well. 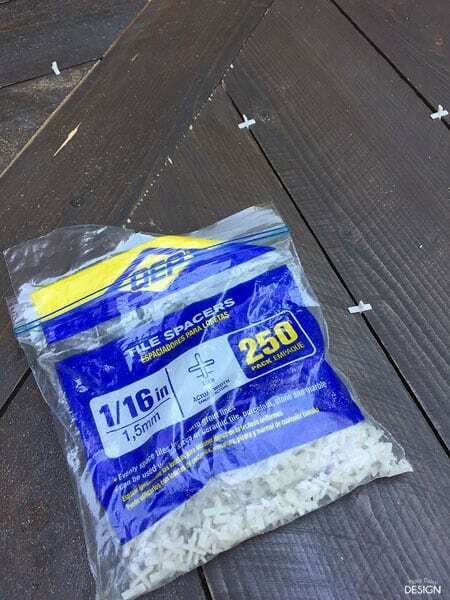 I believe it was around 12 boards because it only coast about $30 to make. 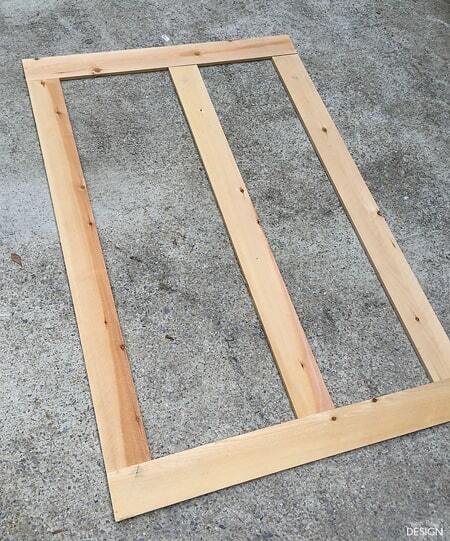 What dimensions are the frame boards you started with? 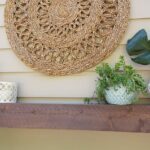 They were basic fence boards, but you could use a 1×6! I think this is what you are asking. Let me know if not. I don’t mean to be “that guy”, but this is technically a split chevron pattern, not herringbone. Chevron ends are cut at 45° angles, where herringbone ends are left square. I hope this doesn’t come off as mean and apologize if it does, just trying to help. Not a problem! Learn something new every day! Probably can’t go change all those pins on Pinterest but I’ll make a note!